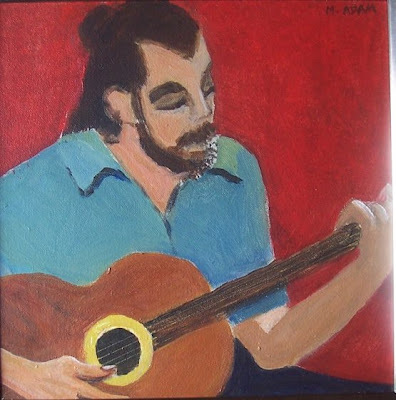 Guitar Player, acrylic on canvas, about 8" x 8"
Which is better, oil or acrylic? Why use one rather than the other? For a while now I've been using mostly acrylic. It's better suited for the kinds of things I've needed to do for OCA courses, and it's definitely better for packing up and sending off to a tutor. It dries quickly and can be overpainted far more easily than oil. Acrylic gear is lighter than oil to carry outdoors. It's less messy to clean up than oil, needing only soap and water. It's almost essential for many contemporary techniques such as layering and dripping and a lot of mixed media work. But it has big disadvantages too. The main one is that the paint shrinks as it dries, losing up to a third of its volume. This means that a passage that looked well-covered while being painted can end up looking thin and streaky after the paint is dry. 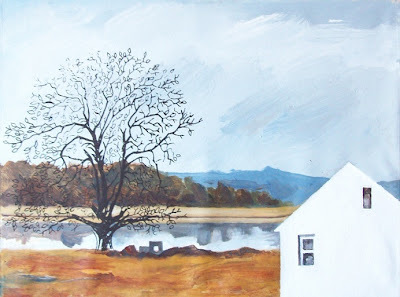 Acrylic also gets more transparent or darker as it dries because the binder is a glue which is white and opaque while wet, but which dries clear. These two together, the shrinking and the darkening, mean that what you see is not what you get. 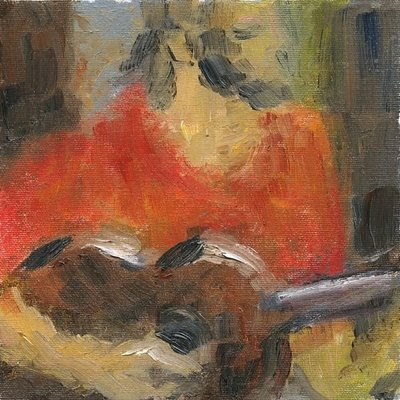 Guitar Player, oil on canvas, approx 7" x 7"
Oil on the other hand is far harder to work with than acrylic. Any given piece is more likely to be a total failure, and it's messy while working and to clean up. But to give oil its due, if you leave a brush overnight loaded with paint, little harm will come to it (though it's not a good idea). A major plus is that the colours are the same when dry as when wet, the only medium where this is so. Despite all its difficulties I prefer working with oil and get more of a feeling of achievement if a piece comes out well. But the bottom line is that both have their pros and cons, and personally I wouldn't want to be without either. Now that I'm venturing into printmaking the same issues are beginning to crop up. Oil-based inks or water-based? Some things never change. 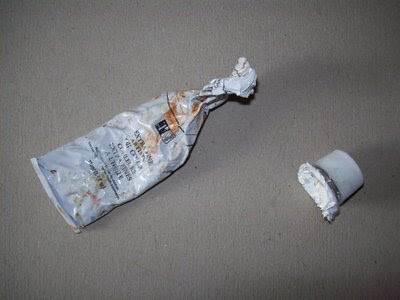 This is what happened when I went to open that tube of white oil paint mentioned in an earlier post (Twisted tube) -- the head and top of the tube came clean off. It just came away in my hand with no effort or force at all. On the bright side, it's easier to get paint out of the tube now, and I've wrapped it in plastic film to prevent the paint from drying out. Can't think of anything else to say!
. . . except the series isn't called "Beginnings" any more, it's not even "Remembered Landscapes". This is the final version of the first piece with the tree screenprinted on. I guess there's some explaining to do, and I'll do it in a few days. 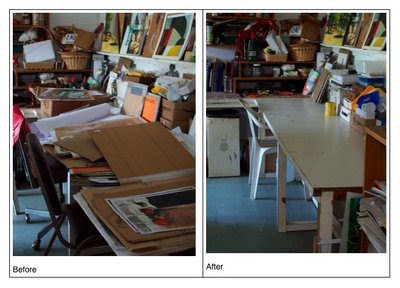 In the meantime I'm still recovering, and the last few days I've been doing a massive studio clean-up. Before and after photos coming soon!